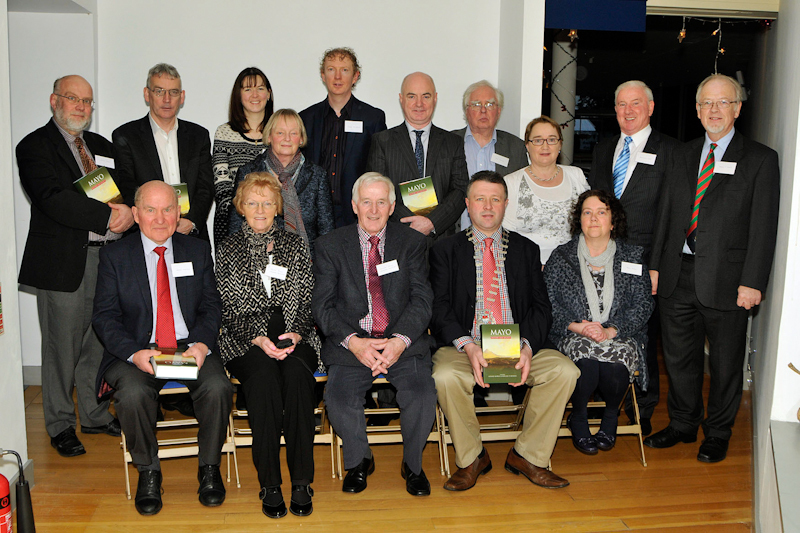 Description : Pictured in the Museum of Country Life Turlough at the launch of 'Mayo History & Society' by Gerard Moran and Dr Nollaig Ó Muraíle, front l-r; Seamus Caulfield, book contributor, Teresa Nolan, publisher, Willie Nolan, publisher, Damien Ryan, Cathaoirleach Mayo County Council and Marie Boran, book contributor. Back l-r; Gerard Moran, editor, Austin Vaughan, County Librarian, Eileen Crampsey, book contributor, Bridget Cresham, book contributor, Fiachra McGowan, book contributor, Peter Hynes, Chief Executive Mayo County Council, John Cunningham, book contributor, Miriam Moffatt, book contributor, Bernard O’Hara, book contributor, and Dr Nollaig Ó Muraíle, editor. Photo © Ken Wright Photography 2014. 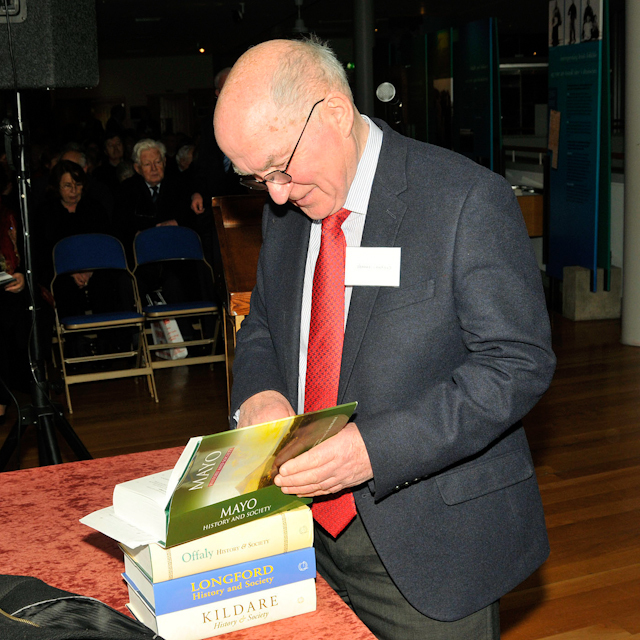 Pictured in the Museum of Country Life Turlough at the launch of 'Mayo History & Society' by Gerard Moran and Dr Nollaig Ó Muraíle, Seamus Caulfield, book contributor, glancing through the book , Photo © Ken Wright Photography 2014. Pictured in the Museum of Country Life Turlough at the launch of 'Mayo History & Society' by Gerard Moran and Dr Nollaig Ó Muraíle, Gabby Zmeu and David Brennan representing the Castle Book Shop. Photo © Ken Wright Photography 2014. 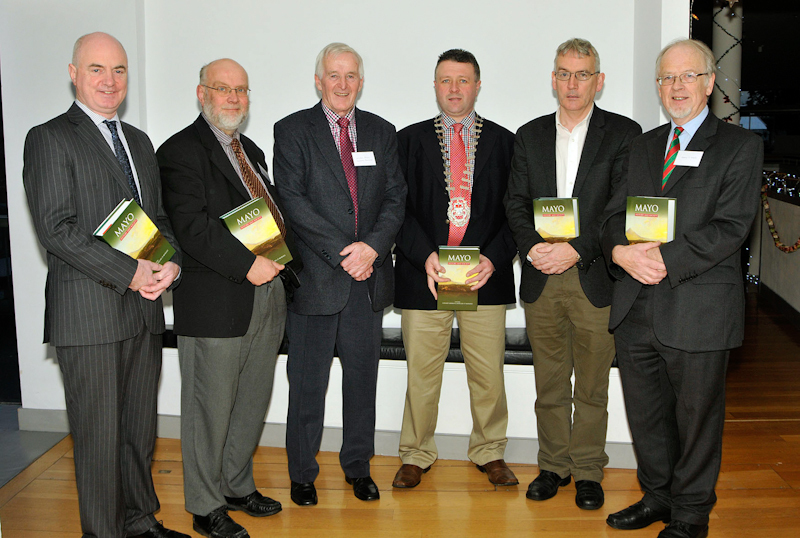 Pictured in the Museum of Country Life Turlough at the launch of 'Mayo History & Society' by Gerard Moran and Dr Nollaig Ó Muraíle, l-r; Peter Hynes, Chief Executive Mayo County Council, Gerard Moran, editor, Willie Nolan, publisher, Damien Ryan, Cathaoirleach Mayo County Council, Austin Vaughan, County Librarian an Dr d Nollaig Ó Muraíle, editor. Photo © Ken Wright Photography 2014. The launch of one of the most important books published in recent years on the history of County Mayo took place in the ideal setting of the National Museum of Country Life, Turlough Park on Saturday 13 December through the courtesy of the Museum's director, Dr Anthony Candon. It was also an appropriate venue insofar as two of the contributors to the book, Dr. Anne O'Dowd and Dr. Séamas Mac Philib, were employed in the Museum. The book, Mayo: history and society. Interdisciplinary essays on the history of an Irish county is volume 22 of the series begun by Geography Publications in 1985. There was a large audience, including many of the contributors to the volume, present. Dr. Gerard Moran, a native of Castlebar and co-editor of the book, was master of ceremonies for the occasion. Dr. Moran welcomed all present and spoke of his pride in being associated as an editor and contributor to this benchmark collection of essays. Formerly a lecturer in history at NUIG and NUIM, Dr. Moran is currently teaching in the European school in Brussels. He told the gathering how a young student from Bulgaria in his school remarked to him that the Irish people have a great feeling for their country and especially for their native region within it. Such a profound sense of place is expressed in publications such as Mayo:history and society and Dr. Moran expressed his thanks to the forty-three contributors who pooled their expertise to give Mayo such a splendid book. Dr. Moran emphasized that the publication of the book was a joint enterprise between the publisher and Mayo County Council and he thanked Mr. Peter Hynes, Chief Executive, Mayo County Council, for his support for the project. Dr. Moran then introduced the first speaker Damian Ryan, Chairperson of Mayo County Council. Councillor praised the publisher and contributors for producing such an outstanding book. Because Mayo County Council placed great emphasis on protecting and enhancing the cultural heritage of the county Mayo:history and society was an invaluable resource which revealed the complex past that the present generation had inherited. Mr. Peter Hynes, Chief Executive of Mayo County Council, hailed the publication as a major event in the cultural life of Mayo. The County Council had a long tradition of supporting publications relating to the history of the county and it was particularly pleased to have been associated with this landmark publication. "Is mór an chúis áthais, agus go deimhin an phribhléid, dom a bheith bainteach le seoladh an leabhair bhreá seo a bhaineann le mo chontae dúchais. Táim fíorbhródúil as an saothar téagartha gleoite seo agus táim thar a bheith buíoch den bhfoireann scríbhneoirí a sholáthair an dá scór caibidlí, geall leis, atá sa leabhar. Táim sásta, go háirithe, go dtugtar aitheantas cuí anseo don ghné Ghaelach de chultúr Mhaigh Eo. Tar éis an tsaoil, tá Maigh Eo ar an mbeagán contaetha in Éirinn le ceantair Ghaeltachta ina maireann an teanga beo, más lag féin í - ceantair a ndéantar dearmad díobh go rómhinic, faraoir. Mar sin, tá trí chaibidil i nGaeilge sa leabhar, ach tá cinn eile ann a bhaineann go dlúth le gnéithe éagsúla d'oidhreacht Ghaelach an chontae ársa seo. As I have just mentioned, there are three chapters in Irish in this hefty volume (by Lillis Ó Laoire, Laoise Ní Dhúda and myself), and several others that treat of various aspects of the county's rich Gaelic culture - here I am thinking especially of a fine piece by Fiachra Mac Gabhann which represents a distillation of his extraordinary ten-volume definitive work on the place-names of Co. Mayo which was launched here in this Museum earlier this year. Other chapters on aspects of Mayo's Gaelic culture include those by Pádraig Ó Riain (on St Patrick), Vera Orschel (on Mayo Abbey), Bernadette Cunningham and Raymond Gillespie (on Mayo's manuscript tradition), and - on the county's rich folk tradition - by Guy Beiner, Séamas Ó Catháin, Anne O Dowd and Séamus Mac Philib. In these chapters, and in those that constitute the remainder of the book's contents, there is, I think you will agree, a feast of learning under a wide variety of headings - archaeology, history, folklore, the song-tradition, literature, cartography, geography, sociology, politics, religion. Speaking on behalf of my fellow-editor, Gerry Moran, and our publisher, Willie Nolan, I can say that we were most fortunate in the group of more than forty contributors (too numerous to name individually) that we managed to assemble. About a dozen of them are natives of Mayo, or closely associated with, or living in, the county. Most of the remainder are from elsewhere in Ireland, but three are based as far away as the American Mid-West, the Middle East and Tasmania, respectively. About half our writers have (or had, at some stage) links with one institution in particular: NUI Galway, where I worked myself until a few months ago. All of the contributors took time out, many of them from very busy schedules, to write a series of important studies that shed a great deal of light on the historical and cultural heritage of this county of Mayo. For this we are truly grateful. I think I am correct in asserting that, between them, they have produced a volume that will be indispensable to anybody in future years who decides to write about Mayo. 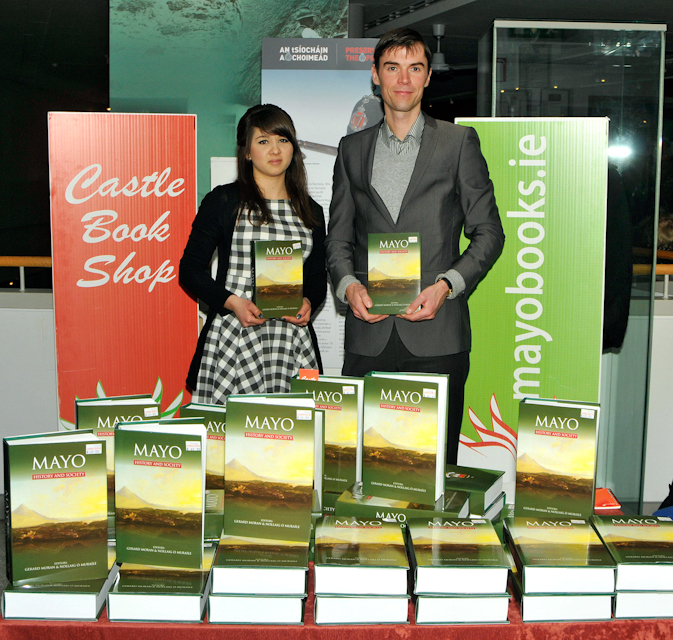 In addition, we can justifiably claim that this book of close on 950 pages is a very handsome volume, attractively designed and printed, with numerous illustrations (many of them in colour), and with a striking dust-jacket that reflects our proud county colours, the celebrated ‘green and red of Mayo'. I have to say that working with Gerry Moran was a pleasure. Our discussions over numerous cups of tea in the college canteen in Galway were always amicable, often lively, and indeed illuminating. On that positive note I will conclude. Mo bhuíochas ó chroí arís le gach duine a chabhraigh linn. Maigh Eo abú!" Dr. Miriam Moffit, the fourth speaker and a contributor to the book on ‘Protestantism in Mayo in the twentieth' told of her pride in been associated with such a major publication. Professor Emeritus Seamas Caulfield was the fourth and final speaker to be introduced by Dr. Moran and to him was given the task of formally launching and Mayo: history society. Professor Caulfield is a true Mayo patriot who has spent a lifetime, as his people before him did, in researching and promoting his native county. He was, said Dr. Moran, the ideal choice to introduce Mayo:history and society, to which he is also a contributor on his beloved Céide Fields, to Mayo and the world. The following is the substance of Professor Caulfield's speech. The book contains thirty eight essays, three of them in Irish and contains a Foreword by An Taoiseach Enda Kenny. Seamas Caulfield paid tribute to the team responsible for the publication namely Mayo County Council who provided significant financial backing, the National University of Ireland for its financial support, the contributors and the two editors Dr. Gerard Moran and Professor Nollaig Ó Muraíle. He paid especial tribute to his colleague from his days in UCD, Professor Willie Nolan and his wife Teresa, whose company Geography Publications are publishers of the series. Mayo is no. 22 and Cavan,also published this year, is no. 23. With Monaghan and Meath at an advanced stage the project is entering its final quarter. When complete there will be an extraordinary collection of over one thousand researched papers, tens of millions of words and tens of thousands of footnotes and references. And this is just the tip of the iceberg, the references and the individual research behind many of the papers containing much more but all presented in a format which is accessible to the interested non-specialist. As important as the individual county histories are, such as the Mayo volume launched in Turlough House, the series when completed will be much more than the sum of all the counties. They will become more important in a centuries time and even more so at the turn of the next millennium as they will have recorded what was considered important lines of research at the beginning of the third millennium. It may seem strange to find such a significant history enterprise emanating from a Geography background but just as ‘no man is an island' neither is any one county and the fact that this History and Society series is presented on a county by county basis defines a geographical approach to the entire series. Its launch in the Folklife division of the National Museum was therefore entirely appropriate as in the predominantly rural society responsible for the material collection in the museum, the past is remembered as geography not as time. It is where events happened not when they happened that is remembered. In this book the range of topics is so diverse that even the most disinterested person would have to find something of interest but equally the most well- read scholars on subjects related to Mayo will find a wealth of totally new information. Seamas Caulfield referred to his dilemma of wishing to give the audience some flavour of the contents of the book but with thirty eight essays to chose from he could either keep people there all evening or else give offence by making choices between the various contributors. In a book of over nine hundred pages, he used the diplomatic ploy of referring to those essays which had the number 13 in their paginations coinciding as it also did with the date of the launch, 13 December. Page 13 is part of a comprehensive essay by Bernard O Hara on the archaeological monuments of Co. Mayo, taking the reader back to the earliest inhabitants of the county seven thousand years ago and up to the medieval friaries. Page 113 falls in Fiachra Mac Gabhann's ‘The Place-Names of Mayo' and if ever the term ‘tip of the iceberg' referred to an essay it applies to this one, drawing so much from and pointing to the massive body of research carried out by the author himself and before him, Nollaig Ó Muraíle on this subject. Pages 213 and 313 deal with two totally contrasting personages in Mayo history. The first, in the essay by John Cunningham (TCD), relates to Oliver Cromwell, the most loathed figure in Ireland's history, whose regime orchestrated the great plantation of Mayo, and the second, Guy Beiner's essay, deals with one of Mayo's enduring folk heroes Fr. Manus Sweeney of the Year of the French. Page 413 is part of Gerald Moran's essay ‘Farewell to Kilkelly, Ireland' dealing with post famine emigration and here again there is a wealth of new information on the extraordinary scale of emigration from the county in the second half of the nineteenth century. Pages 513 and 713 deal with similar topics of land and the attempts to bring some fairness to the ownership of this central resource. Carla King writes on Mayo's messiah Michael Davitt and the United Irish League while Tony Varley compares the Land League with Clann na Talmhan, both land movements which were deeply rooted in Co. Mayo. Page 613 deals with K.J. Rankin's essay on the changing of the old order in an essay on ‘John Dillon and de Valera at the 1918 General Election' which marked the rise of Sinn Féin and the demise of the Irish Parliamentary Party. Page 813 deals with Mary Cawley's essay on ‘Tourist expectations and experiences in County Mayo', a study of modern day tourists' response to Mayo. This is the last but one essay in the book, the final one also on contemporary issues being by Laoise Ní Dhúda as Gaeilge ar Gaeltacht Mhaigh Eo an lae Inniu. Page 913 is part of the comprehensive index, the name at the head of the page ‘Seán Ó Riada' pointing towards another dimension of the book, the last name ‘Charles O'Malley' being a most fitting surname to conclude any book on County Mayo. This random sample of essays, less than a quarter of the total, gives some idea of the scope of this important publication. At €60 it is not a cheap book but makes an ideal gift which will be treasured by anyone who receives it.